Originally posted to AWNews.org in June 2005 by Syntax. Welcome back everyone for the second edition of the Alphaworld Critic. 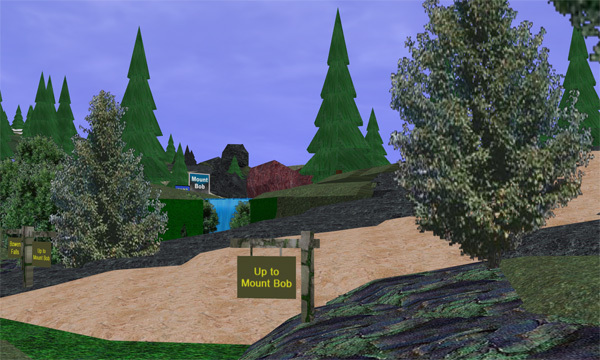 This time around I will be taking a look at one of the more famous buildings in Alphaworld – Mount Bob! Built by citizen Rjinswand back during the early months of 1997, this large wilderness area has it all. Sprawling rivers, steep mountain slopes, dark caves and mossy forests are some of the sights you will see while touring this historic building. When you first arrive at Mount Bob, you will think nothing is out-of-the-ordinary. It looks just like the simple, standard sprite forest that you see all over Alphaworld. Only when you start to look in different directions, you will notice that this building is suspended 80 meters up in the air… with nothing supporting it! If you visibility is high enough, you will see some pretty ugly stuff such as ‘zdeck’ and ‘clrwhl’ textured walls flickering in the distance. The first thing you should do as a new explorer is forget the fact that this building is totally floating & completely surrounded by crappy buildings and pretend you are actually somewhere up in a vast Alphaworld mountain range. Once you start heading northeast into the forest, titled “Wogg Wood”, you will get one of two sensations. If you are an AW old-timer, you will most likely get a sense of nostalgia as this was probably one of the more memorable Alphaworld adventures you had back in the 90’s. When I visit, I can feel the history of Alphaworld all around me. If you are a new-comer, you will feel a sense of adventure. The bright stone path leading through the thick forest will pique your interest and make you want to follow it to see what you can discover while traveling. As you head up the mountain with the distant sound of Bowen Falls echoing behind you, you will arrive at the base of Mount Bob. The mountain itself is constructed solely out of hill02.rwx objects with pine trees dotting the side of it. As you start to climb, at about 100 meters up you will come across a ladder… on a picture object. What probably set this building apart from others in 1997 is that Rjinswand actually took the time to make some custom pictures to incorporate into his building. The most famous of his custom pictures is the animated falls picture he made which can be located in the Carré Caverns. This falls picture can be seen all over Alphaworld, built by hundreds of various users that have copied the URL of the picture as they passed through the caverns. The widespread use of this waterfall picture is proof of the popularity of Mount Bob. What I really like about this building is that it was built with special attention on creating the right atmosphere. Rjinswands’ use of sounds that activated at the right times really added to the building; especially the Forbidden Tunnels. The textures he used to create a jungle-esque feeling after the tunnels are also excellent to experience. A unique feature of Mount Bob that I seem to always experience each time I visit is its ability to inspire. To this day, I still find myself returning to Mount Bob as a source of inspiration for buildings that I am planning or when I don’t have an idea of what I should build next. Surely this building has inspired many other citizens to pick up and create a wilderness area of their own. Mount Bob rightfully won a CY award in September 2000 for Best Environmental Design, which sits at the peak of the mountain.